The deluxe Lancaster London hotel is situated in the heart of London, offering stunning, panoramic views of Hyde Park. The hotel boasts 416 luxurious guest rooms, and two restaurants including Island Grill and the award-winning Nipa Thai restaurant. The Lancaster London is ideally located for guests to enjoy the full experience of Hyde Park from boating on the Serpentine to admiring the beautiful Italian gardens. It is just a few minutes' walk from the bustling shopping districts of Oxford and Bond Street, West End theatres and London's top tourist attractions. "To walk softly on the planet"
The Lancaster London is one of the most environmentally friendly hotels in London and ensures its actions match its philosophy: "to walk softly on the planet". The hotel has taken a very thorough approach to energy saving practices, reducing landfill waste and increasing recycling. For example, the implementation of low energy light bulbs throughout the hotel, gauges on all boiler taps to cap water temperatures and the selection of only ethical and sustainable suppliers for food, glass, paper, etc. The £10 million refurbishment of the hotel's spectacular events spaces and commercial kitchens, currently underway, will see the implementation of the latest green technology, for example, the new dishwashers will have integral heat exchange pumps to reheat the water coming into the machines, thereby saving energy. Behind the scenes, there are weekly staff meetings to monitor recycling and wastage targets and brainstorm new energy saving measures. However, the Lancaster London is not satisfied with these "standard" green measures! There aren't many hotels that produce their own honey! This year, the Lancaster London is stepping up its crusade to save the honey bees by hosting the first ever, free to attend London Honey Show. On 10 October 2011, the Lancaster London will be inviting bee-keeping enthusiasts, commercial honey producers, exhibitors and the general public to an event to promote awareness about honey bees. The event will also encompass a prize-giving for a host of fun competitions such as "Best School/College Honey" "Best Packaging" and even "Best Coloured Honey", in order to try and stimulate a wave of interest in bee keeping. "Lancaster Buzz" cocktails, featuring the ingredient of the hour, will also be served at the event. 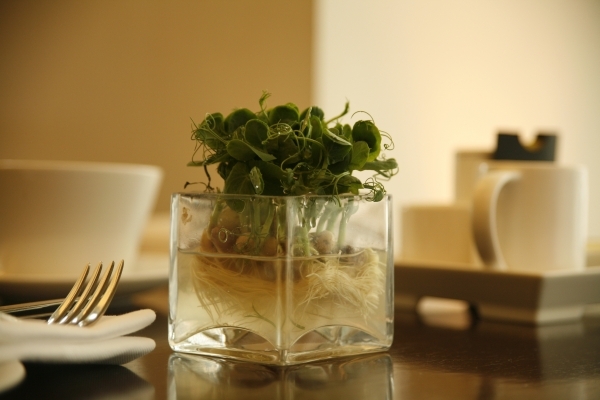 The Lancaster London's latest eco-project has been to introduce more sustainable table decorations in Island Grill. They have replaced the traditional freshly cut flowers with living pea shoots! Pea shoots embody sustainability and waste reduction as they can be harvested in just 2-4 weeks and, unlike the flowers, they will continue to grow and flourish before guests' eyes. Guests may also get a kick out of the novelty of nibbling on the decor! The Lancaster London prides itself on setting an example and hopes to inspire individual guests, businesses and competitors to follow suit. Guests who stay at the Lancaster London are actively encouraged to engage in eco-friendly principles through a variety of means, including an environmental page on their in room TV's making guests aware of small things that can make a big difference, such as re-using towels and keeping windows shut when using the air conditioning (or opening windows instead of using air-conditioning!) There is also a "Responsible Visitor Charter" on the hotel's website for guests with seven simple suggestions for guests to follow the hotel's lead, such as using greener means of travel, for example walking or cycling, and using the bike racks installed at the hotel. The hotel also offers guests the option of carbon offsetting. The hotel is committed to working with local communities and is constantly involved in various projects. Most recently, the hotel raised £1,447.62 for Hospitality Action by adding a discretionary £1 to guests' bills. Before that, the hotel used a similar method to fundraise for the local homeless charity - Sleepsmart. An ongoing campaign involves the hotel donating old TV's and disposable items from guests rooms (curtains and pillows) to the Invisible Children's Charity where they can be recycled and used to raise money. The Lancaster London's herculean efforts to promote sustainability and awareness of green issues through leading by example have gained them wide recognition within the industry, along with top awards including: "Considerate Hotel of the Year", "Visit London Award for Sustainable Tourism" and "Silver Award from Green Tourism for London" to name a few. The awards are very much appreciated by all staff, who work hard to turn quirky ideas into reality and maintain the hotel's reputation as a leader in environmental responsibility.